Juniper Springs Main House - Offering privacy and abundant shade trees this elegant home awaits the arrival of our city dwelling friends in need of a real southwest private retreat. 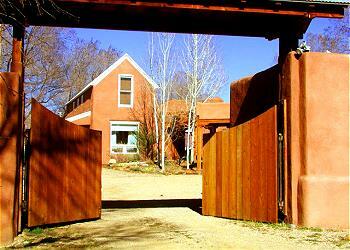 Juniper Springs is located approximately two miles north of Taos Plaza on Upper Ranchitos Road. 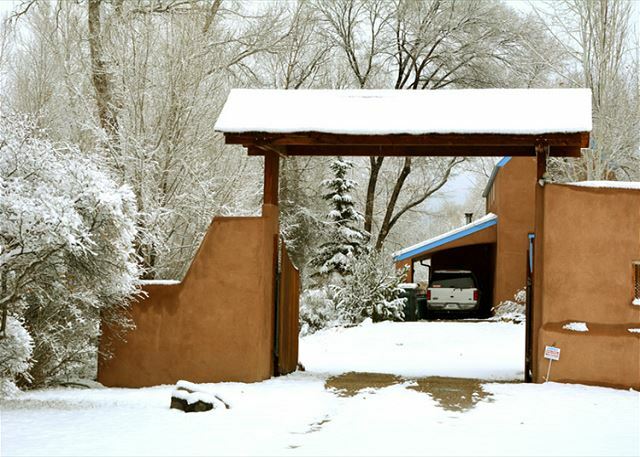 The main house with 4.5 bedrooms and 3.5 bathrooms and the optional guest house offering 2 more bedrooms 1 bathroom and a sweet little kitchen means small and/or large groups can enjoy this Taos treasure. Nestled far from the main roads among Fir, Aspen and Juniper and within sight and sound of the river "Rio Pueblo", Taos Juniper Springs is a sure way to get away from it all. 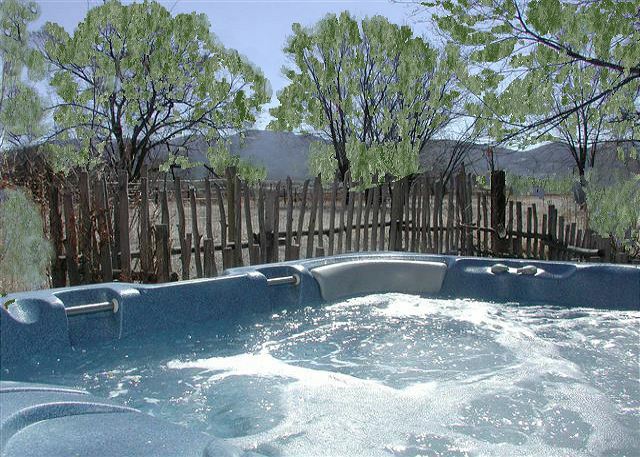 The extra large outdoor hot tub comfortably seats 8 guests and offers incredible starry night skies and fabulous day time woods and mountain views. 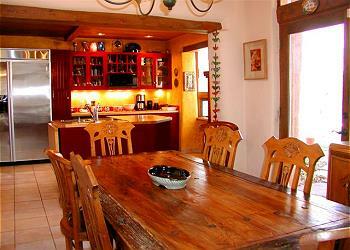 An inviting country kitchen is ambiance abundant and is fully equipped for the gourmet chef. Two sets of washers and dryers (upstairs and downstairs) make laundry a breeze. There are 3 wood burning "kiva fireplaces" - 2 indoor and one outdoor for extended living and outdoor entertainment on chilly nights. For the lap top traveler there is DSL wireless Internet access. 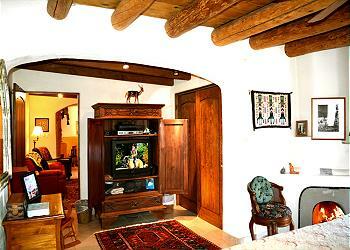 In addition, there are 2 satellite TV's with the top 200 channels and local Albuquerque network stations. The OPTIONAL guest house (an artist studio) is equipped with 2 bedrooms - one with a set of bunks and the other with a double bed. The sweet kitchen with stove, refrigerator and sink allows guests to prepare simple meals or morning coffee as they await the waking of main house guests. 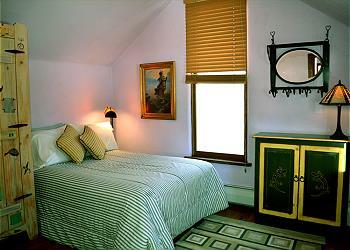 Upstairs is a look-out room for star gazing and is there for your use and enjoyment. 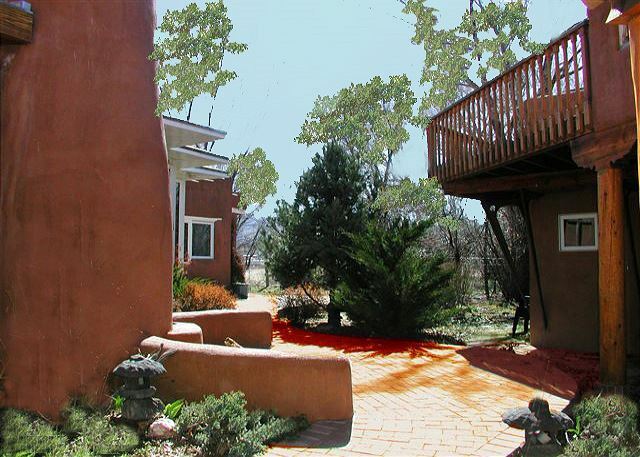 Stay at Juniper Springs, relax, unwind, rejuvenate and you will be telling all your friends about your incredible vacation at one of the most unique upscale Taos vacation rentals ever.